(1899). The uplift of the Himalaya Mountains and resulting increased weathering has been cited as a principal cause of late Cenozoic cooling due to a drop in CO2 (Raymo, 1991). Orogenic uplift generally results in the development of high relief. High relief results in steep slopes and enhanced erosion, and enhanced erosion results in the constant uncovering of primary minerals and their exposure to the atmosphere. In the absence of steep slopes, a thick mantle of clay weathering product can accumulate and serve to protect the underlying primary minerals against further weathering. An excellent example of this situation is the thick clay-rich soils of the Amazon lowlands where little silicate weathering occurs (Stallard and Edmond, 1983). In addition, the development of mountain chains often leads to increased orographic rainfall and, at higher elevations, increased erosion by glaciers. All these factors should lead to more rapid silicate weathering and faster uptake of atmospheric CO2. Proof of this contention is the good global correlation of chemical weathering of silicates with physical erosion (Gaillardet et al., 1999). The idea that past Himalayan uplift resulted in increased weathering on a global scale has been promoted by the study of strontium isotopes. Late Cenozoic seawater is notable for a sharp rise in the 87Sr/86Sr ratio as recorded by dated carbonate rocks. Principal sources of Sr to the ocean include input from rivers from continental weathering and deep ocean basalt-seawater reaction. Continental rocks are on the average higher in 87Sr/86Sr than are submarine basalts. Thus, it has been hypothesized that the increase in oceanic 87Sr/86Sr during the late Cenozoic was due to globally increased rates of weathering and input of strontium from the continents due to mountain uplift. Because most Sr occurs substituted for Ca in minerals, past Sr weathering fluxes presumably can be related to past Ca fluxes and rates of uptake of CO2 via the weathering of Ca silicates. Quantitative estimates of the increase in silicate weathering rate due to Himalayan uplift have been made by Richter et al. (1992) based on the marine Sr isotopic record. However, changes in the 87Sr/86Sr value for the ocean can also be due to changes in the average 87Sr/86Sr of the rocks being weathered rather than due to changes in global weathering rate. This latter conclusion has been emphasized by a number of studies (e.g., Edmond, 1992; Blum et al., 1998; Galy et al., 1999). These studies found that the rocks of the high Himalayas are exceedingly radiogenic and that much of the radiogenic Sr, as well as Ca, in Himalayan rivers is derived from the weathering of carbonates, not silicates. Because carbonate weathering, as pointed out in the Introduction, does not lead to changes in CO2 on a multimillion-year time scale, the use of 87Sr/86Sr to deduce changes in weathering rates has fallen into general disfavor, along with the idea that the Himalayas played a role in bringing about a late Cenozoic drop in CO2 (e.g., Blum et al., 1998; Jacobson et al., 2003). However, the Himalayas and other mountain chains still must have some importance to global weathering and the long-term carbon cycle. Once corrections for carbonate weathering are made, the chemical weathering rate of silicates can be deduced, and this has been done for two small Himalayan watersheds (West et al., 2002). West et al. found that in the high Himalayas silicate weathering is low and dominated by carbonate weathering, as found by the studies cited above, but in the Middle Hills and Ganges Basin silicate weathering is rapid and, on an areal basis, equivalent to other areas noted for their rapid silicate weathering rates. The high weathering rate is ascribed by West et al. to the input of fresh eroded material from the high Himalayas to the hot, wet, and heavily vegetated foothills. Perhaps the major role of high mountains at low latitudes, such as the Himalayas, is to provide abundant, physically eroded, fresh bedrock material to weathering at lower elevations. Another area of the world where mountain uplift during the Miocene may have had a major effect on atmospheric CO2 due to enhanced weathering is the exhumation of the northern New Guinea arc terrain (Reusch and Maasch, 1998). The uplift of a volcanic arc to become a mountain belt would result in a change from net CO2 release to the atmosphere via volcanism to net uptake via weathering of the volcanics and associated sediments. Weathering in this area would have been accelerated by the warm, wet climate at that time (and at present). Basalts, the major volcanic rock type in this situation, would weather more rapidly than the more granitic composition of the Himalayas (see "Lithology and Weathering" in this chapter). Francois and Godderis, 1998). In this way the atmospheric greenhouse effect (see next section) serves as a negative feedback for stabilizing CO2 and climate against possibly large perturbations such as mountain uplift. Nonetheless, it is still possible to use strontium isotope in a long-term carbon cycle model. One approach (Berner and Rye, 1992) is to ensure carbon mass balance while letting the variation of 87Sr/86Sr be due to changes in the relative proportions of granite (high 87Sr/86Sr) weathering versus basalt (low 87Sr/86Sr) weathering on the continents. In this case variations in oceanic 87Sr/86Sr do not represent changes in anything other than the source of the strontium. This approach has been suggested recently by studies that emphasize the quantitative importance of basalt weathering over time (Dessert et al., 2003). Rocb(t) = calculated 87Sr/86Sr value for the oceans for submarine basalt-seawater reaction alone L = adjustable empirical parameter expressing the effect of 87Sr/86Sr on weathering rate. The values of Rocb(t) were calculated from changes in the rates of basalt-seawater reaction assuming that they directly follow changes in rates of seafloor production (for a detailed discussion of seafloor production and spreading rate, see chapter 4). Excess values of measured 87Sr/86Sr over the calculated Rocb(t) values are assumed in equation (2-1) to reflect increased input of radiogenic Sr from the continents. 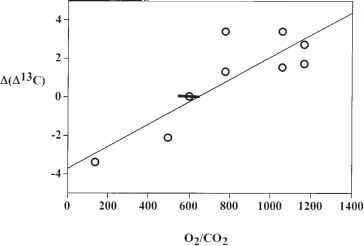 The parameter L is varied in the GEOCARB carbon cycle model (Berner, 1994) to investigate sensitivity of Sr isotope variation to calculated atmospheric CO2 level. 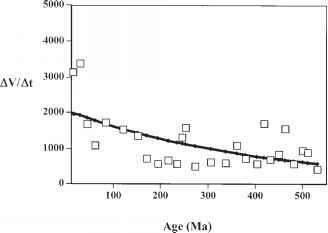 where t = mean age of a given volume of rocks deposited over the time span At AV = volume of rocks of age span At (AV/At)o = rate of deposition at "present"
k = erosion decay coefficient (assumed constant). Equation (2.5) is another derivation for the parameter fR(t) (see equation 2.1). A cubic fit to values of fR(t) over Phanerozoic time is shown in figure 2.2. Included also in figure 2.2 are the results for fR(t) calculated from strontium isotopes via equation (2.1) using L = 2. It is interesting that isotope-based fR(t) values are in very good agreement with the curve fit to the sediment data. This agreement between two independent methods suggests that the use of Sr isotopes to describe the effect of mountain uplift on silicate chemical weathering has some validity. How does uplift affect the carbon cycle? 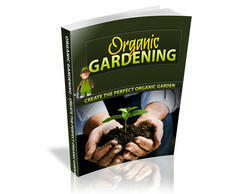 How does erosion/weathering cause the carbon cycle? How does uplift and erosion connect to carbon cycle? What is the role of uplift in the carbon cycle? Do periods of uplift/ mountain building and weathering interact with climate? How are weathering, erosion, uplift related? What does weather and erosion do in carbon cycel? What is uplifting in the carbon? How do uplift weathering remove co2? How do uplift and erosion relate? Why is sedimentary rock more common on the surface? How did the uplift of the Himalayan mountains affect Earth's climate? How does wethering effect the himalayan mountains? How does uplifting and erosion affect the himalayas?